Sun and clouds mixed. High 72F. Winds SSE at 5 to 10 mph..
Carrie Woerner recalled the disappointment her niece recently experienced when the straight-A high school senior applied early to her top choice, Johns Hopkins University, and was denied acceptance. She wanted Tess to know that although she couldn’t get into that particular school, she couldn’t let the disappointment set her back. 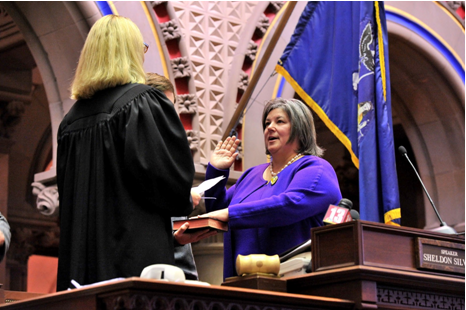 It seems to be a motto Woerner, the new state assemblywoman for the 113th district, applies to her own life. “As you know, it took me two tries to get here,” she said with a chuckle. (Woerner, a Democrat, lost to Republican Tony Jordan in the 2012 election, but defeated Republican Steve Stallmer in November). The 52-year-old Woerner said she has always drawn inspiration from her mother, who passed away a few years ago. Diana was an Ivy-league-educated woman who enjoyed a career with Chase Manhattan Bank in New York City until her daughter was born. She quit to become a full-time wife and homemaker. When Woerner was 15, her parents divorced and Diana found herself, in the mid-’70s, trying to reintegrate into a male-dominated workforce. Woerner never married and lives with Pumpkin, a rescue cat, in an old Victorian home tucked into the Round Lake community that was the site of a Methodist Episcopal revival camp 150 years ago. She graduated from Carnegie-Mellon University in 1984, majoring in technical writing. The summer before her senior year she completed an internship at IBM in North Carolina and was offered a job in Raleigh upon graduation. She still wanted to investigate more opportunities, however, and in January of her last semester she interviewed for a position at IBM in California. Woerner ended up accepting the job and headed west after graduation. She began as a technical writer and rose through the ranks to eventually becoming the manager of a group of programmers. IBM paid for her to get her MBA from Santa Clara University. In 1996, Woerner was asked to take an 18-month assignment at company headquarters in Somers. Woerner’s boss in New York was recruited to set up a sales headquarters for Perot Systems Corp. in New England. She persuaded Woerner to leave IBM after 12 years to create an Internet strategy system for Perot Systems. Woerner stayed with the company for 5 1/2 years until Perot Systems shut down the division. She had a chance to return to IBM but decided against it. “I thought really long and hard about it and decided I needed more risk in my life. I needed a certain energy to keep growing,” she said. Fortunately, Perot Systems had given Woerner a good severance package and she had saved money. She was living in Boston and struggled to find a comparable job. She felt if she scaled down her lifestyle, she could survive for about two years. Meanwhile, she taught a management decision-making class for the online University of Phoenix and volunteered with Citizen Schools in Boston, an apprenticeship after-school program for middle school kids, where she taught cooking. She also gave art and architectural tours at Trinity Church in Boston, which was undergoing a restoration project. During this time, Woerner made a trip to Saratoga Springs to help her mother recover from surgery. After about a week of being together nonstop, the mother and daughter were “starting to get on each other’s nerves.” Diana, who meant well, handed her daughter a stack of advertisements she had clipped from the newspaper. Woerner thought she would try to make both of them happy by sorting through and applying if anything looked interesting. There were many openings for secretarial-type positions, but one ad, for an executive director of Saratoga Springs Preservation Foundation, caught her eye. She applied but didn’t think she would seriously be considered because she didn’t have a lot of experience in historic preservation and lived outside of the area. She had already returned to Boston and was driving on a major interstate highway when she got a call and was offered the position. Woerner met with the board for an interview. Despite the salary being 75 percent lower than what she had made working for Perot Systems, she decided to take the job because she liked preservation. She also liked Saratoga Springs and figured it would cost less to live there than in Boston. Never having worked with a nonprofit organization before, Woerner immediately signed up for a class on nonprofit management. She found an apartment in Saratoga Springs and relocated to become the new director in September 2002. She also got a Main Street grant to refurbish buildings along Beekman Street as part of a revitalization effort to turn the area into an arts district. “Without question, that was my proudest accomplishment,” she said. Woerner bought a green-and-pink Victorian home in Round Lake and firmly set down roots there 12 years ago. As much as she loved her job with the preservation society, she felt she needed to earn more money. Around 2008, a friend who owns Wall Street Transcript, a company that, among other things, publishes biweekly industry reports for Wall Street analysts, offered her an opportunity. The firm created online conference registration software and one-on-one meeting scheduling, and did Woerner’s friend wanted to create a division that would turn the software into a product. He hired her as vice president of MeetMax. Janet Patenaude of Round Lake has known Woerner for about 7 1/2 years and works in web development and customer service at the company. She said Woerner is a strong proponent of women working in the technology sector and is respected for her leadership abilities. She is not one to “overly manage” her employees, according to Patenaude. Sacks said she was impressed with Woerner’s intelligence, personality and ability to see different sides of the issues. “I think she was a good fit. We didn’t always agree — there were times we had opposite opinions, but that’s good that a board doesn’t agree all the time on the different issues — but she’s willing to compromise, which is important when you’re on a board,” Sacks said. Neighbor and friend Sharon Walsh said Woerner has a “keen sense of place” and helped to find state funds to refurbish the Round Lake Auditorium, a historic structure built in 1860 that houses the oldest operational manual organ in the country. It once was the site of religious camp meetings but now serves as a hub for concerts and performances. In recent years, the structure fell into disrepair. Vandals smashed windows, the roof leaked and the paint was peeling. Woerner knew there was a cell tower that sits on park land and any revenue generated by it could be used for capital improvements. She thought to investigate whether the auditorium also sat on park land and discovered it was. Thus, capital improvements, like a new roof, could be drawn from the funds associated with the cell tower. Woerner didn’t recall how much the roof cost but said it was “substantial.” The painting, however, was not considered a capital improvement so she spearheaded a fundraising campaign to make sure it got done. “She has a drive to improve things, the drive to preserve things and she really has an understanding of what’s important and how to best use the resources,” Walsh said. understood the potential of the chip fabrication plant to be a strong economic boost for the community, but she was concerned that without adequate planning to protect the area’s agricultural and open landscapes, Saratoga County could turn into another Silicon Valley in California, in which over development destroyed its inherent beauty. Woerner called to inquire about openings on the town of Malta Planning Board and after being interviewed, was accepted. Both her roles on the village and planning boards led to her desire to run for the state Assembly. “I was not convinced that the state was as engaged as it should be in what was happening here, and so I felt we needed to have a state representative that understood what was going on and would be in a position to be helpful to the towns and businesses that hopefully would be interested in taking up residence in the tech park and surrounding areas,” Woerner said. Round Lake business owner Leah Stein of Leah’s Cakery brought her 11-year-old daughter to the ceremony. “It was a wonderful opportunity for her to see a woman who lives around the corner from us be able to be in a position to make great change,” Stein said. Woerner said she is ready to get to work. Her immediate priorities are on restoring money to the gap elimination adjustment fund, working to build an agricultural and technological base that will draw young people to settle and work in upstate New York and streamlining the regulatory process to make it easier for new companies to flourish. Read Meg Hagerty’s blog at www.poststar.com and follow her on Twitter @HagertyMeg. She worked very hard for the job and has come upon it deservedly. She had to overcome a pretty good anti-Democrat headwind in this past election. Her qualifications for the job are impeccable. Lovely article highlighting Ms. Woerner's background & employment history. Thank you. It's helpful to know "the innards" of our elected officials, outside of what campaign ads drill us to believe. Sounds like we have one of those rarely found (in politics) "good guys" (gender neutral) batting for Upstate Ny. Yay! I hope Ms. Woerner is able to navigate/ circumvent rigid party lines without suffering disenchantment & disillusionment -to get some real work done for us in the Assembly. It sounds like she's well qualified to succeed playing long-entrenched "Party Politik" games. I'm rooting for her! So is this article to counter the previous article about Woerner voting for Silver? 575, did you read why she did that? She believes in innocent until proven guilty! Um, let's see, Joe Bruno got indicted, tried and convicted then overturned and got a big refund for his legal fees. Maybe if more than just an investigation had been announced and actual charges were filed, there would be more to the story? Maybe as someone who just walked in to office she thinks actual findings of wrongdoing and charges might be more relevant before she casts a negative vote? Love the way you jump the gun and imply something else. Oh well. I believe that Carrie Woerner is going to be one of the best representatives this region has seen in years. Her dedication to doing things the right way and in an open and transparent manner is a breath of fresh air. Hope some of the other electeds in the region are as good at doing their jobs as she appears to be! Apparently we need to told what a winner we have. I expect this is to offset some radical votes from her. Assemblywoman Woerner has visited Hartford more times in the last year than all the other regional reps have in the last 5 years combined.